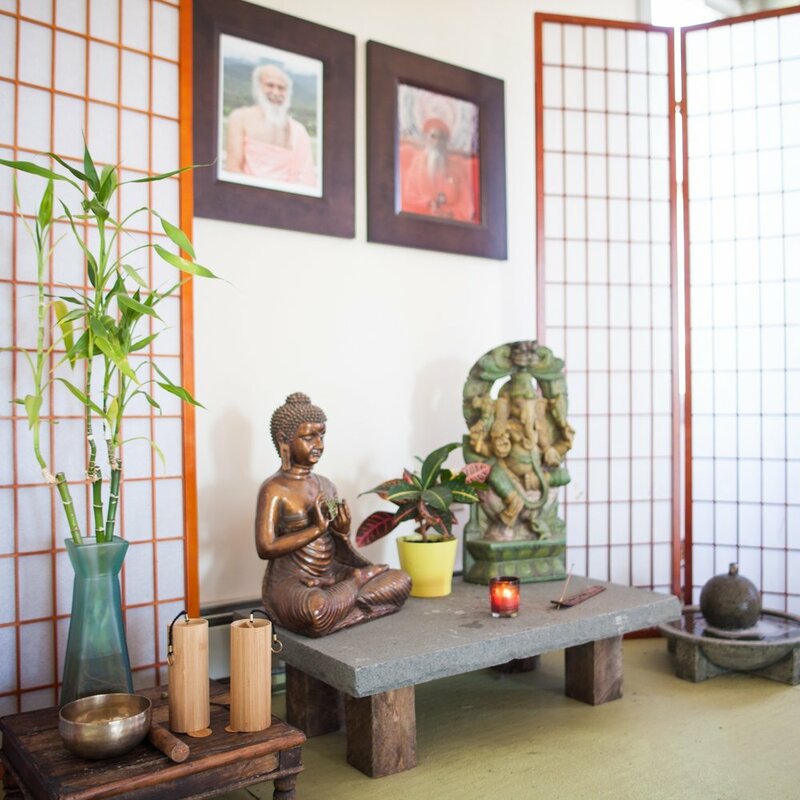 At Yoga Lab we see yoga and meditation as a brilliant holistic system. It gives us practices, tools and guidance for living a balanced, happy and healthy life. It offers the possibility for individual and social evolution and it is accessible to everyone. Everyone can benefit from yoga’s potential for promoting individual wellness, healthy relationships and a more caring world. Here are three different ways for you to take a deep dive into the practice of yoga and all the benefits it has to offer. There's something for everyone. This is our foundational course. It is good for you if you are new to yoga or would like to strengthen your understanding of the fundamentals. The 4 session are held on Tuesday evenings from 7-8:30pm. Yoga Lab 101 is led by Shawn Harrison, Creator and Steward of Yoga Lab and Cory Nakasue, Co-Developer of Educational Programming. If you would like to purchase a 1 month unlimited class card from Sep 25-Oct 25 2018 the cost is an additional $65. This is a special offer for Fundamentals students (1 month unlimited class card is usually $100). An unlimited class card gives you the opportunity to take as many of our regularly scheduled classes as you like and actively practice what you're learning in Yoga Lab 101. Use promotion code YOGALAB101 at checkout. This is our specialized course of study. If you are ready to move in a new direction, challenge what you think you know and deepen your understanding of yourself and the practice of yoga, this program is for you. Yoga Lab 201 can be taken as a stand alone immersion or as the first 100 hours of our Teacher Training Course. For the teacher training track begin at any time and take all 10 weekend sessions, in any order, within two years. Then move on to the Yoga Lab 301 Apprenticeship to complete your training. Or, if your interest is in an immersive learning experience, join in any or all of the weekend sessions. Yoga Lab 201 is led by Shawn Harrison, Creator and Steward of Yoga Lab and Cory Nakasue, Co-Developer of Educational Programming. 10 Month Course Cost: For the complete 10 month course, we construct a plan with each person depending on their needs and their stage in life. The cost is a mutually agreed upon “market rate” and may include bartering. The key elements of our classes are listed below. Some have links to interesting articles. Use all of this to inform your understanding of yoga and enhance your in-class experience. One way to define yoga is as a system of physical postures, breathing techniques, and meditation to promote bodily or mental control and well-being. The Yoga Sutra is an ancient philosophical text made up of 196 sutra. Each sutra is a short bit of wisdom (an aphorism) that requires contemplation and direct-experience to be fully understood. More than any other text, it guides and informs our modern yoga practice. That these teachings are relatable and relevant over a thousand years later speaks to their universal wisdom. We include study of the Yoga Sutra in our Gentle and Open yoga classes. This study takes different shape on different days – sometimes sharing a reading in class, other times having a discussion, or we may engage in a specific exercise that helps to illuminate the teachings. Creating space for this kind of self-inquiry and reflection gives everyone a chance to make contact with the ancient wisdom - turning the words into something meaningful, real and alive – bringing us closer to an honest and authentic yoga experience – making the practice bigger and more beneficial than simply focusing on yoga as exercise. By practice, we mean engaging in exercises and techniques that are part of the yoga system. The physical application is one aspect of practice i.e. yoga postures and breathing exercises. Another, equally important, part is the mental application i.e. mindfulness techniques and concentration exercises. At first practice is something you do in class and then maybe at home for a few minutes or longer. Eventually it spills over into your whole life. Every interaction, every task, every challenge, every situation becomes an opportunity to practice yoga. Every moment an opportunity to experience balance and peace. A yoga posture, or asana in Sanskrit, can be defined as a physical position that is designed to help us live well and live comfortably in our bodies. Breath control, or pranayama in Sanskrit, is a key element of the ancient system of yoga. The quality of our breath affects every aspect of our being; our mental state, the health of our organs, nervous system and all the other systems of the body. By using different breathing techniques, we have an opportunity to improve both our mental and physical states. When we talk about vinyasa at MYLab, we mean the link between movement and breath. Bringing these two together to practice conscious motion and connection. Linking movement and breath is one of the main techniques we use to cultivate mindfulness. It requires a lot of mental strength to watch the breath AND coordinate it with movement, making it a great exercise to help increase focus and concentration. A focused gaze, or drishti in Sanskrit, can turn your practice into a moving meditation. Drishti is the place where your eyes rest, the place where you are looking at any moment. Usually where you are looking is where your attention is. Choosing a spot to focus your gaze helps to keep your attention in the room and slow down your mind. We usually chant OM at the beginning of class and Lokah Samastah Sukhino Bhavantu at the end. There is no translation for OM, it is a sound vibration that stand on its own. The translation of Lokah Samastah Sukhino Bhavantu is may all beings everywhere be happy and free. Click on the audio file below to hear this chant. ARTICLE : What is Mindfulness? on Kabat-Zinn's definition of mindfulness,“Mindfulness is awareness that arises through paying attention, on purpose, in the present moment, non-judgementally...It’s about knowing what is on your mind.” Some version of Sun Salutation, Surya Namaskar in Sanskrit, is practiced in almost all of our classes. It is a really good way to bring movement and breath together. There are many variations of sun salutation; at MYLab we practice classic Sun Salutation, Sun Salutation A and Sun Salutation B. Take a look at the links to get a feel for the sequences. And remember to be patient with yourself, it takes time to get comfortable with bringing all these different movements together. Little by little it gets easier and easier, until over time it will become second nature. At MYLab, we weave stillness into all of our classes. In the form of savasana (final relaxation) at the end of class and at other times throughout. Practicing pausing. Pausing physically. Pausing mentally. It takes practice to get good at pausing skillfully. Knowing when to move and when to be still. Knowing when to respond and when to observe. This is an awesome life skill that we don't have much opportunity to develop. Yoga class is your chance. Standing postures build strength and set the foundation for a safe practice. Seated postures-tone the belly, massage internal organs and balance back muscles. Supine postures- are done laying down on the back of the body to release stress and promote flexibility. When we talk about meditation, we are referring to the practice of concentrating our attention on a chosen focal point. The focal point could be the breath, a particular sensation, a spot on the floor or a sound in the room. It is the groundwork for mindfulness. Using these focal points to anchor our attention, our yoga practice becomes a mental as well as physical exercise; a moving meditation. Sometimes we spend a few minutes at the end of class practicing seated meditation. Bandha refers to the use of specific muscle groups. There are three major bandhas, distributed evenly throughout the body. Each of these muscle groups relates to one of our three diaphragms: pelvic, respiratory and vocal. The use of the pelvic and respiratory bandhas give us access to a deep inner core strength. This strength aligns and stabilizes the spine. It gives us access to untapped energy. At the end of every yoga class we rest. We get cozy with any props or blankets needed to be comfortable, then lay on the floor and be still. For some this is their favorite part of class, for others it's a challenge. This stillness balances out the movement. It also gives the body time to integrate the benefits of the yoga postures and exercises we just engaged in. And, maybe most importantly, it gives you a chance to be still with nothing to do and nowhere to go. An attitude of openness, awareness and non-judgement that can be evolved through the practice of yoga. Using yoga to uncover and experience; presence, balance and joy.